Laugh, bake and eat with family! If you're looking for something fun and different to do with the kids, then this is for you. There really is something for everyone to enjoy in my bread making family package. The kids will have loads of fun making things by themselves, there'll be times when you all make bread together, and there'll be time for mums and dads to spend together too, while the kids take a break. I will arrive at your house with all ingredients and equipment we need, and set up for our day of baking bread. 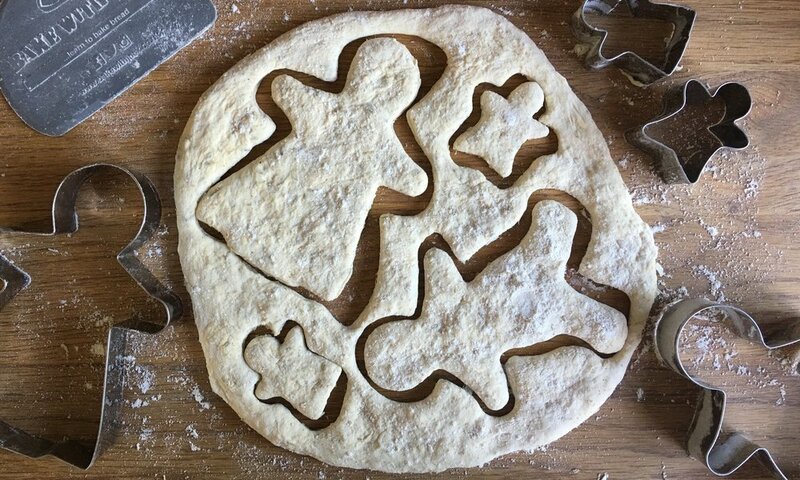 We'll make our doughs all together, the kids can go and play while their dough rests, and we'll tackle the more tricky breads and meal preparation. Then, we'll call back the kids to take the lids off the dough and see how much they have grown! We'll get to work shaping up all our breads together, and while they are baking I will put together a tasty lunch for us all. Together we'll set the table ready for a delicious tasty meal with all your fresh breads too. I will tidy up everything, making your kitchen spick and span as if nothing ever happened! Gifts: You can purchase any of my bread making experiences as a gift, just select the gift voucher option on the enquiry form.